There's nothing plain about the Amish Hardwood Deluxe Jewelry Chest with Lid. Enjoy the luxury of the rich lining as you open this beautiful jewelry chest. There are golden hooks to hang necklaces, soft pouches to tuck delicate baubles in, sectioned trays for bracelets and cushioned rows for rings. Offering a bottom drawer that pulls out to store larger items, this Amish solid wood jewelry box is a dream come true. 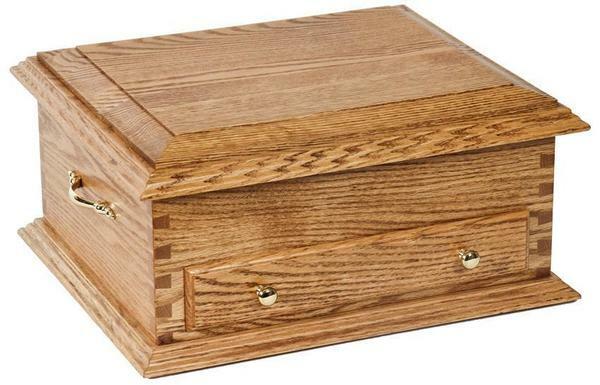 Customize your Amish jewelry box with your choice of solid oak or cherry wood. Enhance the decor of your bedroom with this beautiful wooden jewelry box sitting on your bedroom dresser. Surprise a loved one with the perfect gift. An Amish solid wood jewelry box is an heirloom that will be enjoyed by future generations. Call one of our Amish Furniture Specialists today at 866-272-6773 with any questions. 18" x 15.25" x 8.25"